After they had communicated with each other, after having found each other, only over the waves of the internet – the two of them finally flew from each coast, West and East, to meet in New Orleans. It was like finding a long-lost sister… or an unimagined lover, or both. They spent the evening in a French Quarter bar drinking frozen Irish Coffees and gushing at each other. After texting and Skyping so much, years worth – they worried that there wouldn’t be anything left to say to each other… but the opposite was true. So many truths, so many secrets… even a few sweet, sweet, lies. When they finally kissed in the photo booth behind the bar it was like a jolt of static electricity. But what did they really know about each other? What do any of us. “It’s one thing I don’t worry about,” I said. 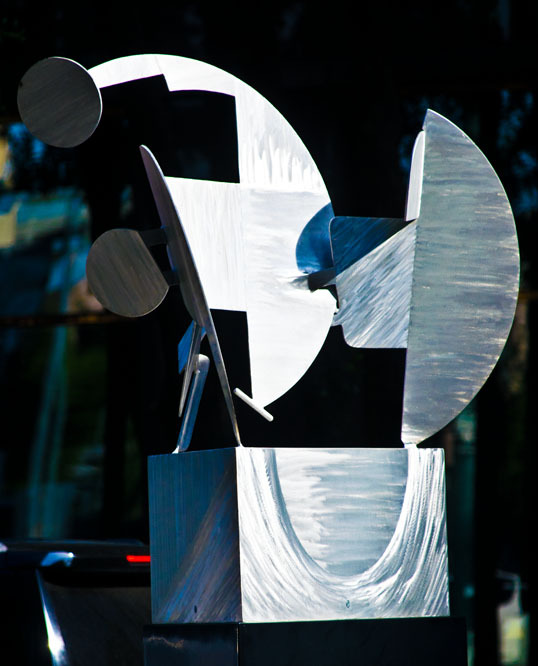 In the City of New Orleans there is a fantastic arrangement of sculpture along Poydras Street. 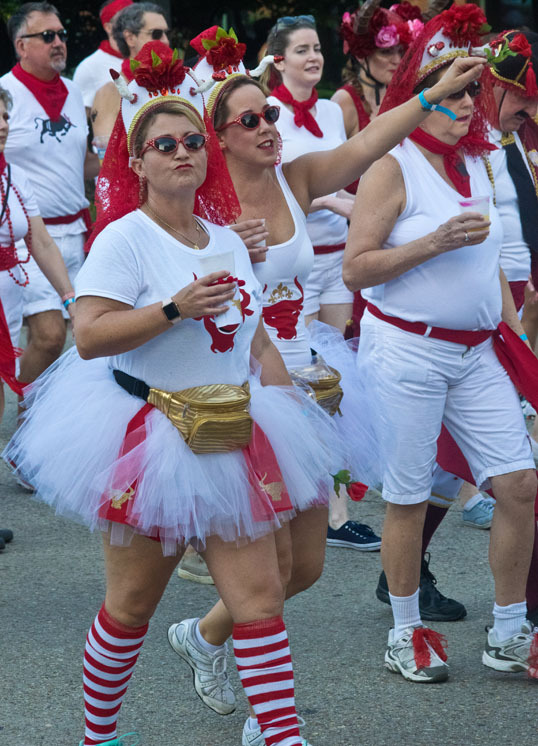 Walking down and back from my son’s apartment to the Running of the Bulls I took photos of a few of them that I’ll share with you. 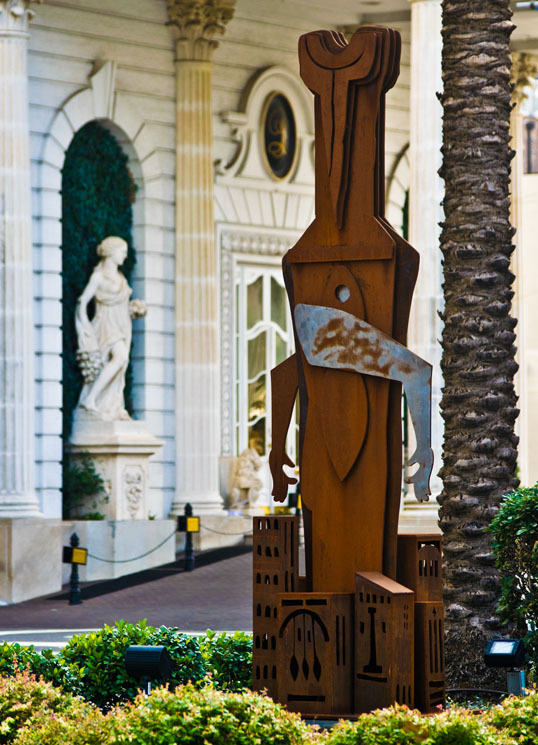 The Guardian is a giant figure, a hybrid of a man and a bird, standing for the inhabitants of a great city. It represents a creature activated by fear capable to rise up each time humanity doubts its own powers to overcome injustice and inhumanity. Across Poydras and down a few doors from my son’s apartment is the Le Pavillon Hotel – originally named the Denechaud, then for generations was the De Soto Hotel. – which boasts an ornate entrance with huge classical statues flanked by massive Corinthian columns. 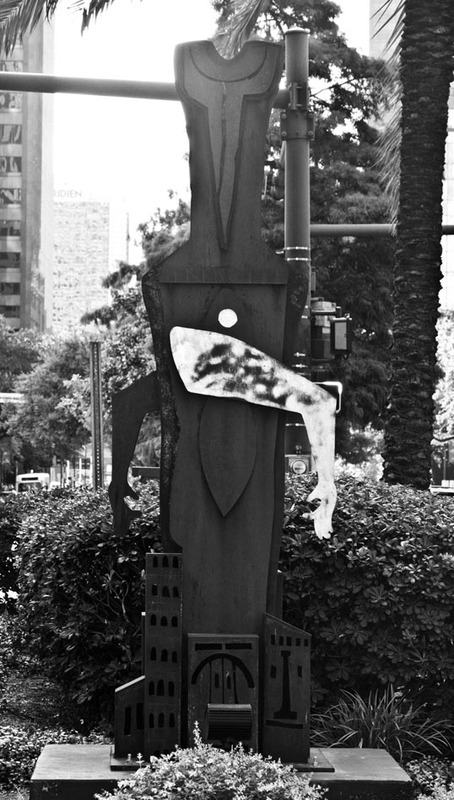 I loved the contrast with the modern sculptures scattered along the median of Poydras. From my son’s apartment pool, look up, I could see the bleached white back of a statue on a wall against the sheer drop down to the street. I found out this was a sculpture at the Le Pavillon’s pool. I was oddly fascinated by this – and one day want to visit. 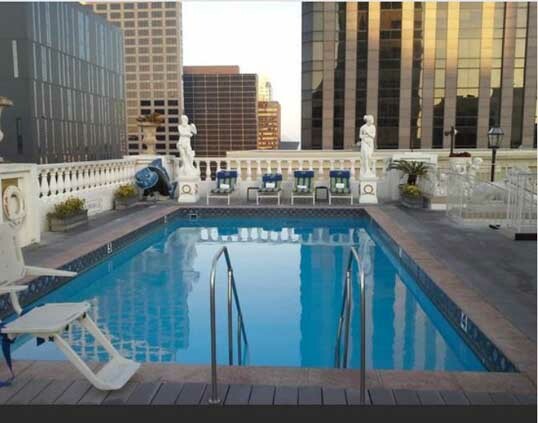 The pool at Le Pavillon, from TripAdvisor. You can see the sculptures against the wall. The blue-gray building with vertical windows behind and to the left is my son’s apartment building. “Black Butterfly” is an abstract aluminum sculpture completed four years after John T. Scott was awarded the MacArthur Genius Award. Scott’s work frequently displayed themes related to African-American life, particularly the rich Afro-Caribbean culture and musical heritage of New Orleans. 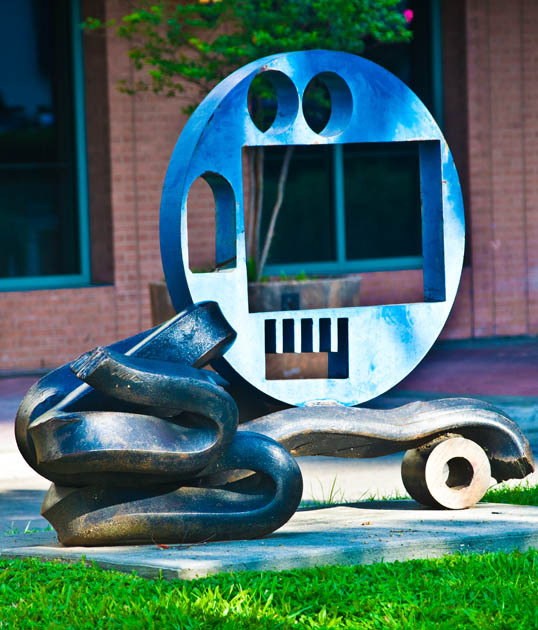 See this sculpture on Poydras Street at O’Keefe. 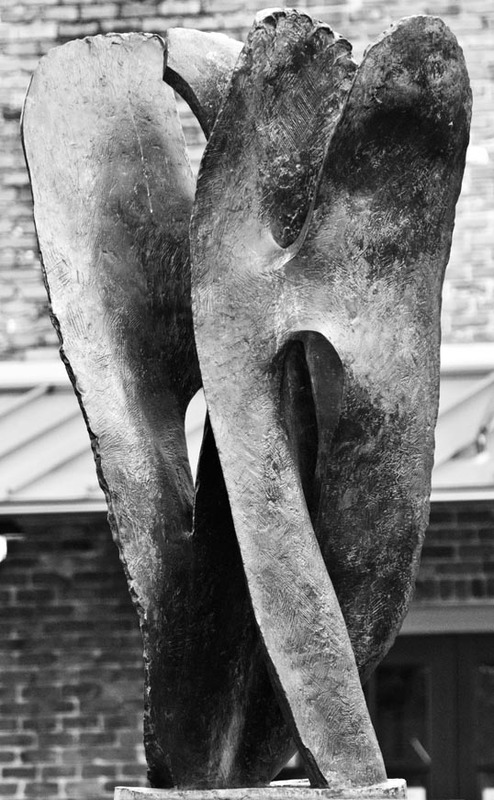 Looking at the photo I took, I had a hard time making sure I had the title and sculptor right. Photos online looked so different. I realized that the sculpture looks completely different from various angles. Now I need to go back. I need to go back, walk around the sculpture, and look at it from all sides. Shame it’s in the middle of a street – I’ll have to risk it.